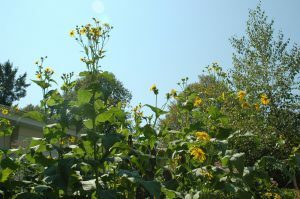 That lecture opened Daniel’s eyes to the possibility of turning his own yard into a refuge for birds, bees, butterflies, beneficial insects, and other wildlife by planting the vegetation they rely on most for survival: native plants. The Environment and River Gorge Committee, part of the Longfellow Community Council. 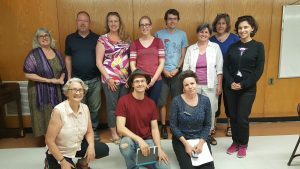 Many of the people on the committee helped grow and lay the foundation for the Greater Longfellow Community Wildlife Habitat Project and have long advocated for green spaces in the neighborhood. “I knew I had to do something in my own yard because if we want wildlife to survive we need to let it thrive in our urban and suburban landscapes. There’s simply nowhere else for wildlife to go,” he explains. 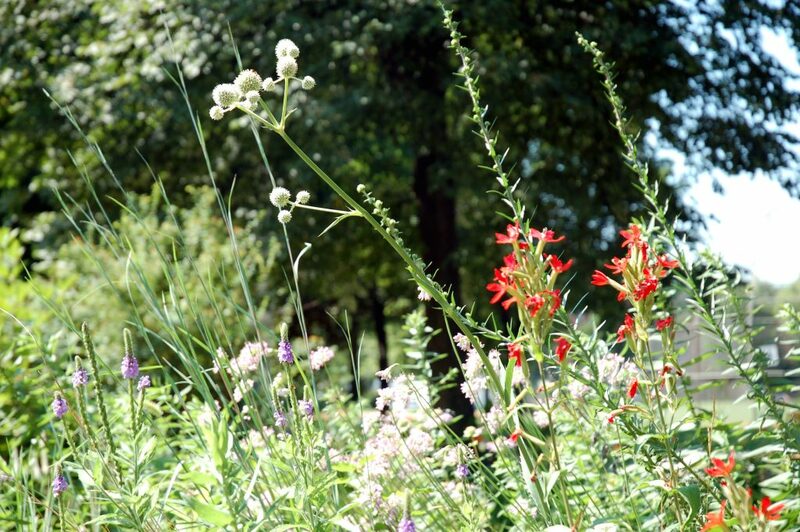 A sunny spot for hoary vervain, rattlesnake master, and royal catchfly native flowers in the Schultz garden. Daniel, a business owner and busy father of four young children ages three to nine, somehow found the time to install and maintain a large native plant garden in his yard. And then he had a “lightbulb moment” after learning about the National Wildlife Federation’s Community Wildlife Habitat Certification program—a program that certifies an entire community as an official wildlife habitat if a specific target number of participants becomes certified. The brainstorm: certification of his own community, the Greater Longfellow neighborhood, located in South Minneapolis, Minnesota. With a population of 23,000, certification would require a minimum of 150 certified backyard wildlife habitats, four schoolyard habitats, and four common areas certified as wildlife habitat. To become certified, the backyard, schoolyard, or common area must offer the basic elements that all wildlife need: food, water, cover, and places to raise young. The program also requires that the community program mandate “sustainable gardening practices such as using rain barrels, reducing water usage, removing invasive plants, using native plants and eliminating pesticides.” In addition, the certification must be sustained by ongoing educational programming. After receiving approval from the Greater Longfellow Council, Daniel promptly set out to meet the challenge. Through tabling at local events, showing up at plant sales and garden center events, and partnering with other community groups, Daniel discovered his neighbors had a strong interest in becoming a certified wildlife habitat community. Ongoing placement of notices in the social network Nextdoor have triggered a robust response from throughout the area. In less than two years, 42 backyard, three schoolyard, and one church wildlife habitat have been certified. The response has been so strong that Daniel is now working to connect mentors—individuals with a solid understanding of gardening with native plants as well as sustainability issues—with mentees who want to become involved in the program but who are not sure how to get started. Ideally, mentors have native plants to share from their own gardens to help cut costs and to help with getting gardens started. Making the best of a rained-out native plant sale. 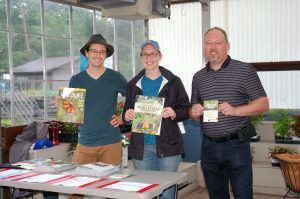 From left to right: botanist and president of the Native Plant Society, Michael Lynch; conservation information manager at The Nature Conservancy, Marya Johnston-McIntosh; and Greater Longfellow neighborhood community wildlife team leader and master naturalist, Daniel Schultz. While the community has a way to go to become officially certified, it is the journey and not the destination that is important to Daniel. “It’s all about reconnecting people with nature. It’s also been great meeting neighbors, sharing ideas, building community, and networking with other groups,” says Daniel. And then, checking his email he remarks with astonishment, “I just got five more responses from people interested in the program.” Surely, the Greater Longfellow neighborhood will be joining the 200 communities across the country that are certified by or registered with the National Wildlife Federation, in the very near future. 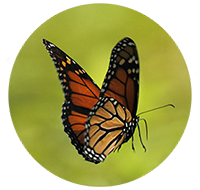 Click here for more information on the Greater Longfellow neighborhood Community Wildlife Habitat program.